With the official National Signing Day for college football being held on Wednesday, Bristol Central’s Justus Fitzpatrick announced his intention to attend American International College in Springfield, Mass., this fall and play for the Division II Yellow Jackets. “Excited & blessed to say I will be continuing my academics and athletics career at AIC,” Fitzpatrick announced via Twitter. “Those guys have been recruiting him for a while there,” Bristol Central head football coach Jeff Papazian said. Fitzpatrick, who could not be reached for comment in time for this story, liked everything about the school, Papazian added. “We’re happy that he gets to continue his athletic career, and more importantly, continue his academic career there, too,” he said. Fitzpatrick was the only player from the city to earn All-State honors from the Connecticut High School Coaches Association for the past 2018 season, earning a place on the Class L defense for his work in the secondary. He was a four-year varsity player and three-year starter who played a number of positions for the Rams. 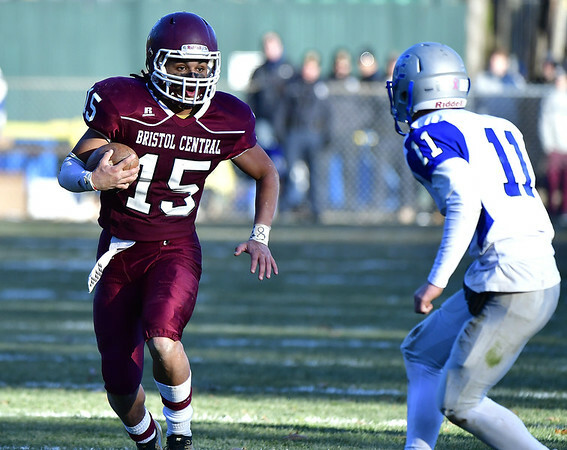 He capped his career at Bristol Central by rushing 30 times for 171 yards and two touchdowns in the Thanksgiving Day game against Bristol Eastern. Fitzpatrick, who took on a new position as quarterback last season, finished his senior year with 995 rushing yards and 16 touchdowns on 208 carries. He also completed 45 of 86 passes for 635 yards and five touchdowns for a total offensive output of 1,630 yards. A member of the Northeast-10 Conference, AIC went 1-8 last year under long-time head coach Art Wilkins, who has led the squad to four NE-10 conference titles, most recently in 2013. Papazian added that he’s happy for Fitzpatrick and his family. “Any time any one of our players is able to go on and compete at the college level … I think that’s a good thing for everybody,” Papazian said. Posted in The Bristol Press, Bristol Central on Wednesday, 6 February 2019 21:57. Updated: Wednesday, 6 February 2019 21:59.